I’ve been nudged, prompted, badgered and pleaded with to provide an update on restoration and I know that it is overdue. 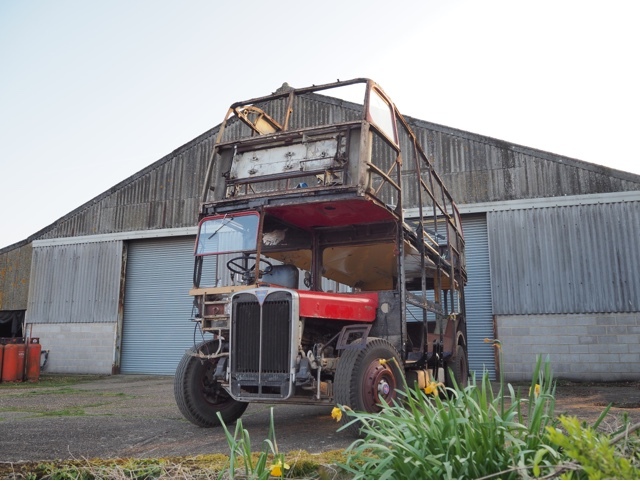 The delay has not been because I have not been doing anything on the restoration – far from it – I have had more time available recently and much of it has meant that I can crack on with the work at hand. However, as I have mentioned before, everything takes a long time (particularly when you are working alone – I’m up and down ladders like a window cleaner!). Anyway, here is an update and I will try to cover as much as possible so that you have the fullest picture. 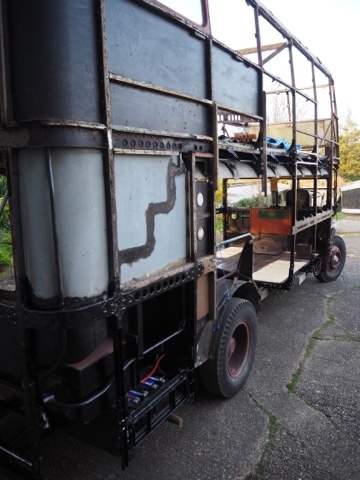 The primary aim has been to make the structure sound, as without a good base it would be impossible to ensure that every right angle is actually a right angle and that every straight line along the length of the bus is a straight line along the whole length of the bus and not an almost straight / a little bit wavy line. 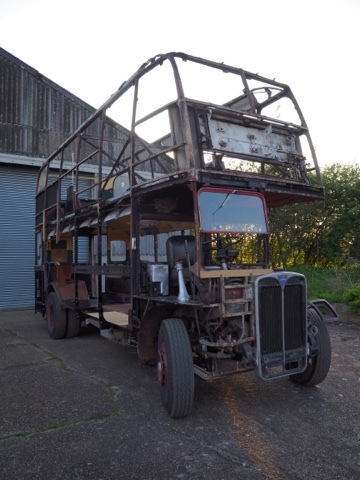 It became apparent that the bus did have wavy lines when I started the restoration due to multiple points of corrosion. 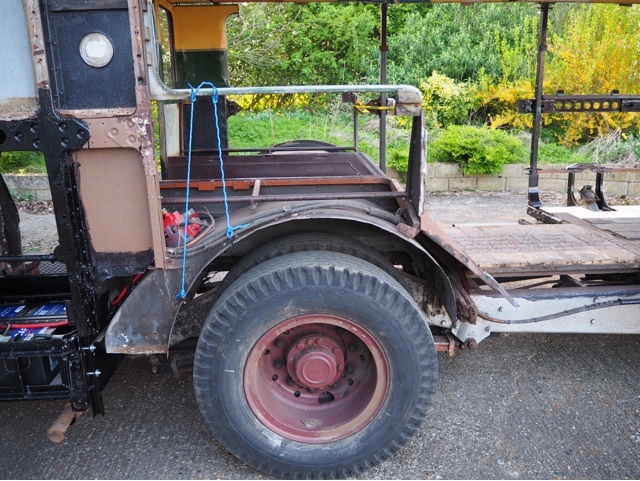 In fact, there were very few points anywhere on the bus that had not suffered corrosion that needed attention. As has been seen, the roof had to be removed as it was beyond repair. 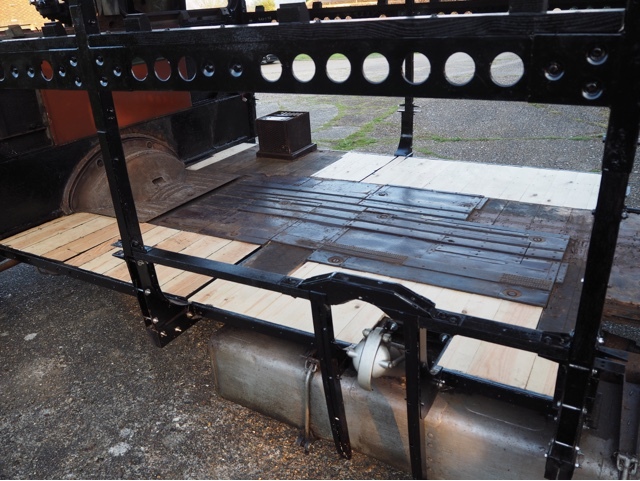 The riser had to be replaced (the riser sits on the back end of the chassis, beneath the rear end of the body and supports the body and the platform). The platform had to be replaced. Within the main body, every pillar needed repairing and all of them had perished between the upper and lower decks (a common problem) and the upper deck had dropped by between one and two inches. The pillars are supported by outriggers, which are metal sandwiched between pieces of wood. The wood on the outer one third of the outriggers was rotten and had to be replaced. Between each of the pillars at the base, the floor edge supports (sometimes referred to as longitudinals) all needed replacing along with the brackets on the ends of them. The outer one third of the lower saloon floor needed replacing. The brackets at the base of the floor had to be replaced. 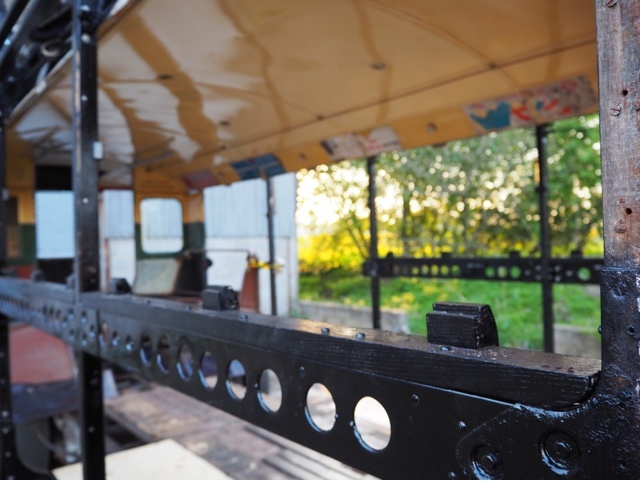 Between each pillar (just below the window) on the lower saloon, waist rails needed repairing or replacing, as did nearly all of the brackets connecting them to the pillars and one missing seat bracket. The area around the fuel filler pipe is intricate and took a considerable amount of time, effort and expense to repair and replace components. Of the above, bays one and two have been completed in the lower saloon. 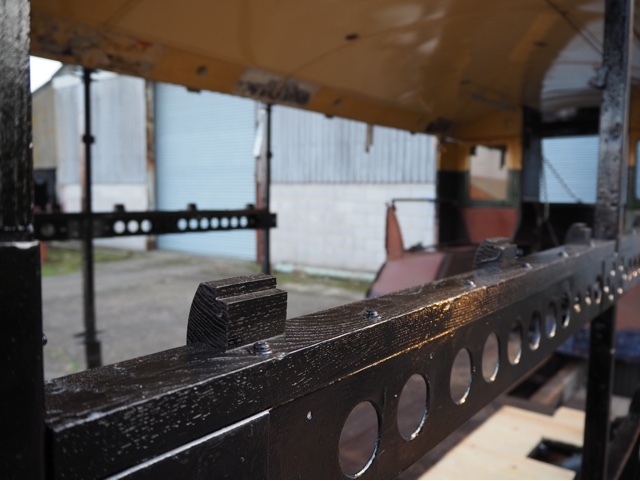 All of the waist rails are ready, brackets to fit the pillars between bays 3 and 4 have held up progress with those bays and are still yet to be received, although progress has been made in that department. 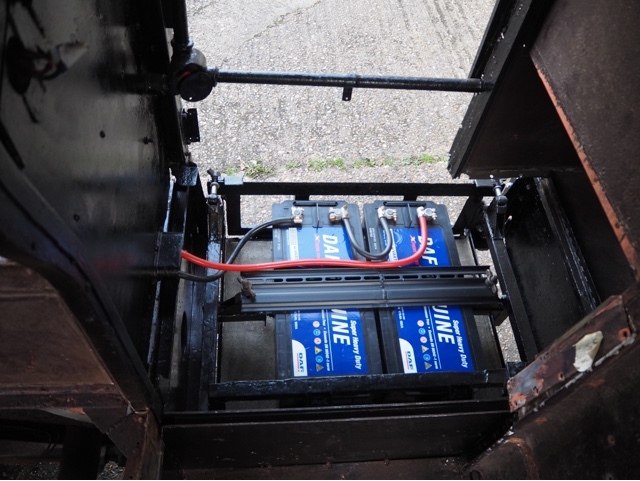 The photos show the near completed first two bays along with the completed riser, platform, rear wood and battery compartment. 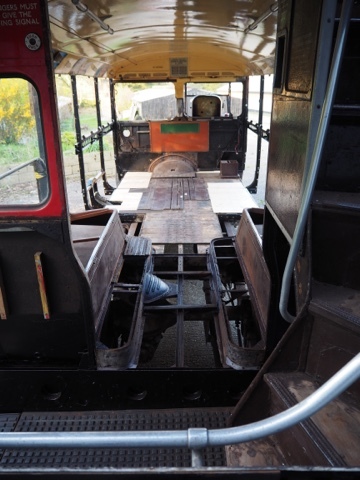 I have also started work on the steel girders behind the cant rail at the front of the bus, of which the lower section on both sides had perished. 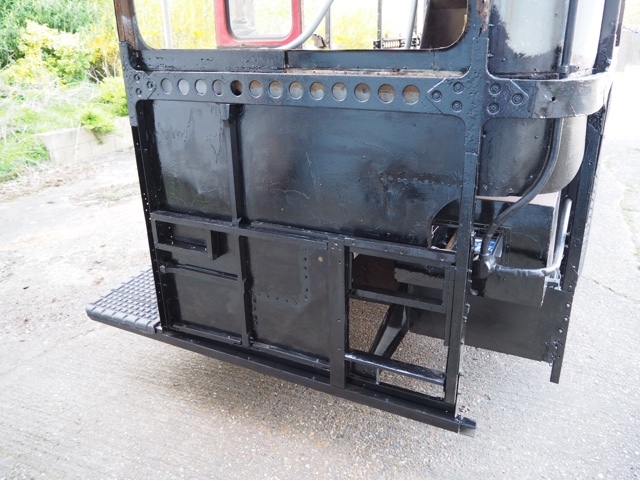 The metal parts of the cab body have been rust treated. 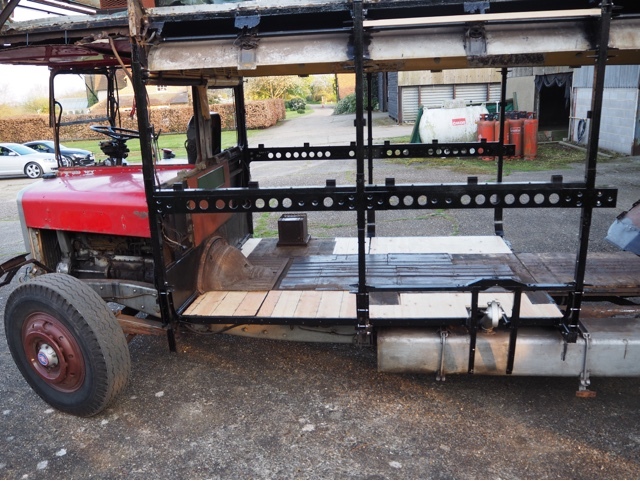 I have most of the wood needed to fit to the cab, but it is not a priority. 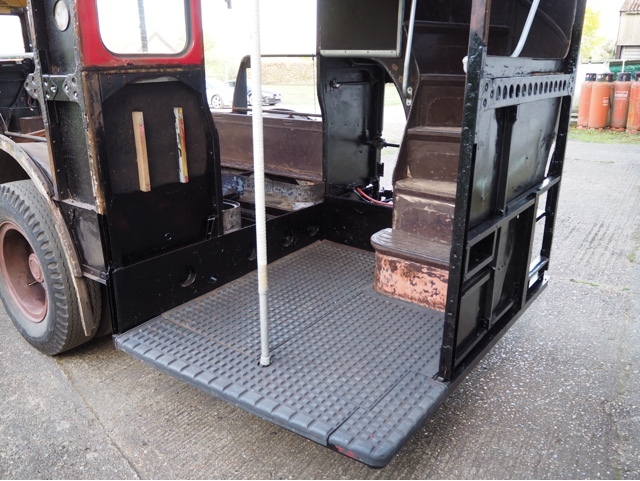 I am currently working on reinstating the floor in the lower saloon all the way to the back of the bus and fixing the kickstands around the long seats. The rear wheel hoops are on the agenda and I am thinking ahead to the roof, planning on constructing a new one based upon original drawings. For now, many people will look at the photos and hardly notice any difference. I know the thousands of individual tasks involved and I am pleased with progress. With a large group of workers it would get done a lot quicker, but that is something that I don’t have.